President of Saudi Commission for Tourism and National Heritage,(SCTH) Prince Sultan has directed to complete archaeological excavations at the site of Asham in Tehama west of Baha region in its 3rd season, 1440H within 44 archaeological projects implemented by the commission this year. A specialized team under the leadership of Professor /Khalid Muhammad al-Zahrani and a number of researchers, professionals,and technicians from Antiquity and Museum Sector and the Regions Sector at the Saudi Commission for Tourism and National Heritage has embarked on the project to uncover the remaining architectural elements of the trade market. The project would uncover the extent of the mosque’s association in the vicinity, along with concentrating on the industrial area, where it is hoped to reveal a number of furnaces melting tools and casting metals, which characterized the site since the pre-Islamic period. It is hoped that the archaeological works at the site will reveal a number of architectural details and archaeological finds. The approval of SCTH president comes after the success achieved in the first and second phases of the project which concentrated on the areas of the trade market and the mosque. The works resulted in discovering a number of architectural elements in the market area consisting of two lines of neighboring shops with an open courtyard that might have been used for exchanging various goods. The head of the team Khaled Zahrani said that the archaeological works in the previous seasons revealed walls and pillars along with a terrace in some rooms in the market area as well as a number of archaeological findings including completed pottery, glass and metal archaeological finds in addition to finding broken pottery and glass utensils represented in parts of edges, bodies and bases, along with glazed pottery of different colors as well as parts of soapstone dating back to the early and medium Islamic period. Add to this advanced tool used in mining. Al-Zahrani pointed out that the main mosque, which is considered one of the early mosques constructed in the south of the Arabian Peninsula includes a foundation stone indicating renovation its building in 414H/1023AD. Asham Mosque is located north of the site nearly in the middle of the residential area and is characterized by a unique architectural design with an area of about 27 X 24 meter. The mosque consists of three corridors with a niche (Mehrab) projected outward in the middle of the Qiblah wall, in addition to another niche that might have been used at the times of fine weather. The mosque open courtyard is 17 X 27 meter. It seems that the whole mosque was built of stones of different sizes indicated by the multiple stone blocks scattered on the site as a result of the destruction of the mosque walls, the fall of stones in and out of the mosque. The number of pillars carrying the mosque ceiling is 30 pillars held on square or rectangular pedestals built of longitudinal stones. There are also a number of pillar pieces based on the interior wall of the mosque. All the mosque walls and foundations are built of stone covered with a layer of mud plaster and gypsum. There are square masses on the pillars and niche ground and the eastern corner of the mosque that might have been remains of a rectangular minaret in which a 70- cm square building rises in its middle, which top may be demolished. From the inside, the minaret has a stone staircase leading from the bottom to the top. 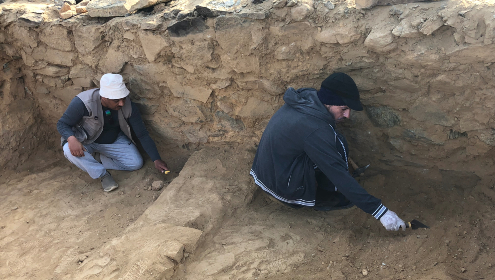 The project falls within the specialized research project "Ta’deen” (Mining) which focuses on archaeological work at the ancient mining sites besides a number of other sites at Ablaa’ in Asir and Halit, in Riyadh. The archaeological works in this project yielded many significant results about the activity of investing raw mineral materials during the early Islamic periods, and the most prominent aspects of transformation in the production of raw mineral materials at the Arabian Peninsula community.